alisaburke: you me and the sea retreat is now open for registration! you me and the sea retreat is now open for registration! I’m so excited that I will finally have a public space to open up for classes and retreats! 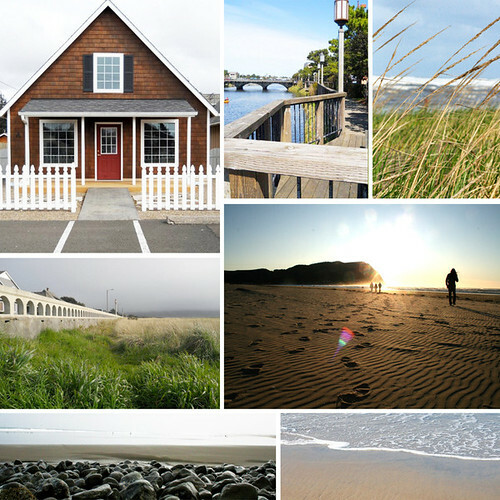 My new studio building is located in my fabulous hometown of Seaside, Oregon – a lush coastal community with miles of beautiful pristine beaches and vivid ocean views. Seaside is a small coastal resort town surrounded by nature’s wonders: Elk wander freely in our yards; seals mingle with the surfers; gray whales and dolphins graze offshore; tide-pooling at dusk; beachcombing after a winter storm unearths treasures washed up from far-off lands half a world away. It’s a combination of the historical past (near Lewis & Clark’s final destination) and quaint modern coastal community. The vintage 1920’s promenade boardwalk skirts the Pacific Ocean for a mile and a half and in the summertime the town is buzzing with activity. This is my hometown and the magnet that has been pulling me back North for so long. It’s my greatest dream and exhilaration to offer classes and retreats in Seaside, Oregon and to share the wonders of the Oregon Coast with you. From an artistic perspective, growing up on the Oregon Coast made me a seeker of wonders. From the old growth woods, perched above the ocean, to the thundering surf pounding against the rocky shore, to the fog hanging over sandy beaches- the landscape offers up its treasures and dynamic inspiration to the willing soul. 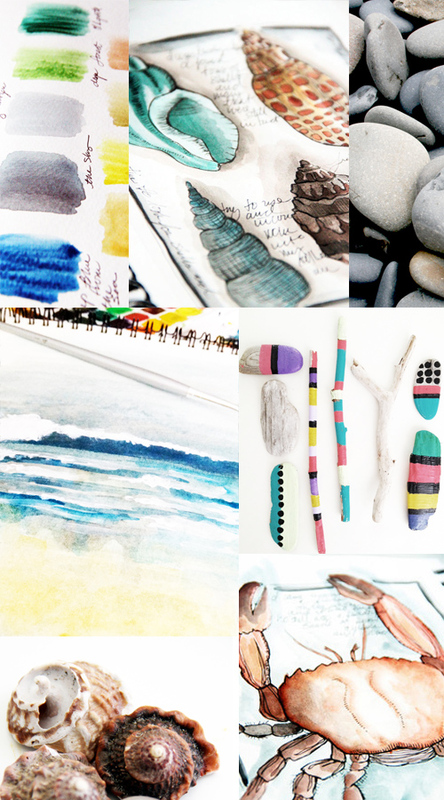 “You, Me, and the Sea” is a small retreat designed to share the inspiration of the Oregon Coast and the opportunity to immerse yourself in sketching, painting and mixed media projects based on the natural wonders of the sea. Together we will spend 3 days in a whirlwind of creativity- drawing, painting and projects inspired by the ocean and its offerings. We will absorb the colors, materials, and treasures of the landscape and turn them into unique artwork. In the weeks and months ahead I will announcing one days classes and creative opportunities at the studio space so stay tuned! Oh I do wish I could join you, but its a bit far from Oz. oh congrats. so many happy exciting things for you. and i am in love with this area. smiling BIG over here. How exciting to have a new teaching studio. I will be in Oregon next week actually. Portland, Eugene and Newport on the coast. I will have to look at the map and see where Seaside is. congratulations, Alisa, for making another of your dreams come true. The workshop sounds fabulous, your studio adorable, and the photos and description enticing. Well done, girlfriend!!! What a great idea! I live by and find inspiration in the ocean as well. Congratulations on your new studio Alisa! 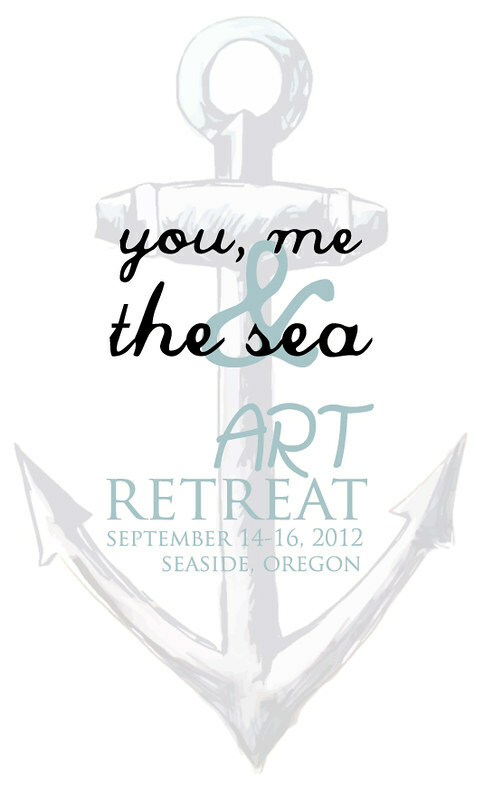 I just booked my spot in the You, Me & the Sea art retreat, and I'm beyond thrilled! My husband and I will be celebrating our 30th wedding anniversary that month, and this is an early present! We visited the Oregon coast last October and fell in love with the natural beauty there. I look forward to seeing you in September! Congratulations! I love Seaside. We used to attend the National Dance Competition in Seaside when our daughter's studio competed. Lots of great memories. I am lucky enough to love by the sea in Cornwall but I still wished I lived closer to sign up. I can't wait to hear more about the one-day classes you'll be offering! I would love to sign up for some creative fun! I LOVE the ocean--but the ocean of my childhood is the Atlantic. I hope to one day come for an art retreat, so keep them coming! This would be my dream retreat...only the airfare from Hong Kong would cripple me! I am so amazed that you are making this dream come true for you. We are the same age and I have 2 kids and am going through a lot of the same emotions that you share on your blog. I would love to live by the sea and can definitely appreciate the creative power it has. I'm so hoping I can find a way to one day go to your studio and learn with/from you. Congratulations! Congratulations on the new studio/retreat space, Alisa! I have never been to Oregon. This looks like a great reason to make it up there (finally). I hope to attend a future happening! I signed up and and can't wait to learn from you and make new friends! I'll be driving in from Vancouver, B.C.